Smithies has his medical certificate, (which is required for solo flying), withdrawn because he has hypertension. As a result, he learns instrument flying while he is forced to ride in the passenger seat. So these flights are now continuing on a pretty regular basis. 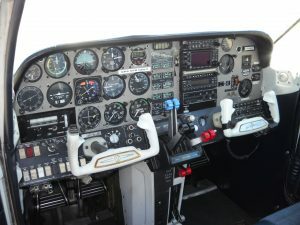 For example on the 2nd of June, I’m flying the Cessna by myself, crosswind, takeoff, and landings, plus or minus flaps, and then two days later, on the 4th of June, Schweizer, or still assumed, and then as I’d already mentioned, on the 4th of June, 1977, I went solo in the glider. However, immediately after those flights, I have a line across the logbook which was “Medical certificate, temporarily, with luck, withdrawn, pending appeal on stress test data.” This is the result of hypertension that was noted, and I was under medication for treating the hypertension, but had to undergo various tests in order to have the medical certificate granted, or a waiver of the various difficulties. This is rather significant, actually, because it meant that I could no longer fly solo until this temporary block was overcome. But it didn’t mean that I couldn’t, fly but I’m in a position of waiting to have the tests. It turned out to be a happy problem in disguise, because then instead of just quitting, I decided to work towards instrument flying, because that required a lot of instruction, and I could continue flying dual whilst getting an instrument rating. So here on the 11th of September, in 1977, I’m flying a Cessna 182, I’m beginning to learn instrument flying with Field Morey as my instructor. So there are, over the next ten days or so, there are five or six flights, localizer tracking and orientation patterns, and ADF interception, etc. So quite a lot on ADF, that’s Automatic Direction Finder, the crudest type of approach instrument with the radio help, a pointer that points at the radio, which was available back in the time of Lindbergh’s flying.